The Mega-Coupler has solid nut tabs that won’t break off. It uses standard 1/2" by 1-1/4" long hex head grade 8 bolts to secure your load. 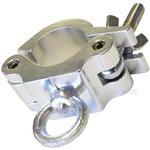 The bolt head locks into the hex milled pocket so that you can tighten the nyloc nut while the clamp is installed. The Mega-Coupler fastens from (1.25" Pipe) 1.66" OD to 2 " OD truss tube and has the industry compatible 14 mm thick base. Our Mega-Coupler has solid nut tabs that won’t break off. 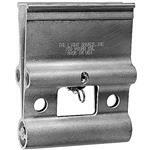 It uses standard 1/2 inch by 1-1/4 inch long hex head grade 8 bolts to secure your load. 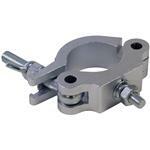 The bolt head locks into the hex milled pocket so that you can tighten the nyloc nut while the clamp is installed. The Mega-Coupler fastens from (1-1/4" Pipe) 1.66" OD to 2 " OD truss tube and has the industry compatible 14 mm thick base. CHAUVET DJ encourages customers to make safety a priority by utilizing the right clamps and cables for their lighting applications. 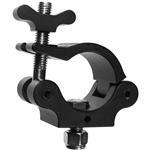 Made of steel for extra durability, the CLP-02 is a medium-duty c-clamp with adjustable knob fits on most fixtures. 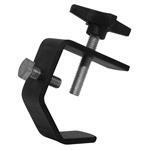 The Blizzard Klamp-C is cast aluminum wrap-around clamp that fits 2” truss. 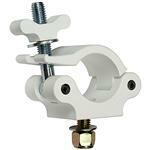 The Blizzard Klamp-N is a narrow aluminum clamp designed for 2” truss. 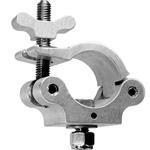 The narrow profile of the Klamp-N™ allows additional mounting options versus normal clamp. The Light Source Mega Truss Dolly, 2x 12" or 1x 20.5"
1" x 6? 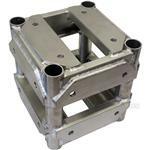 × 21-7/8" 6061T-6 Aluminum CNC machined with pockets to support one piece of 20.5" truss. 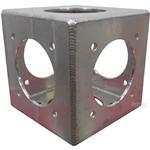 Truss is secured by two aluminum pivoting links, half inch swivel bolts, and our solid wing nuts. 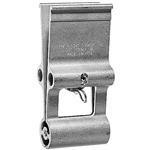 Has two rigging holes for shackles, motor, or chain hook. The Mega-Truss Pick will suspend one ton of truss, and an additional one ton load suspended under the truss. Please note that these do not fit a Global Truss or Applied Truss. 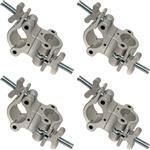 See Global Truss Picks for correct part # to order. Presentation is everything to your audience, so when you want to add that extra nice décor to your set up, use Odyssey’s Scrim Werks™ Slip screens. The TS1205 Slip Screen™ truss wrap covers any 12”x12" square, 5 ft. long truss. Slip it over a dull or scratched up truss and transform it into a clean white column or illuminate it in glowing majestic colors with an LED light wash**. Presentation is everything to your audience, so when you want to add that extra nice décor to your set up, use Odyssey’s Scrim Werks™ Slip screens. The TS1205 Slip Screen™ truss wrap covers any 12”x12" square, 8 ft. long truss. Slip it over a dull or scratched up truss and transform it into a clean white column or illuminate it in glowing majestic colors with an LED light wash**. 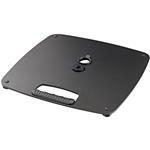 The smallest base plate from the K&M series is only 410 x 410 mm in size and weighs 7 kg. Thanks to the integrated socket, the base plate is compatible with all common distance rods and tube combinations with M20 threaded bolts. Additional useful advantages include a practical integrated handle, a cable management and four stable feet covered in felt. With the included wrench the tube combination can be setup to individual specifications. 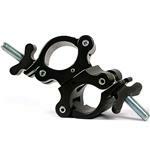 The Slim-Claw will fasten to both 1-1/2 Schedule 40 pipe (1.90 OD) and 2 OD truss tube. 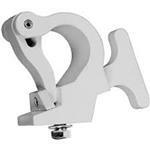 The Claw has a 3-1/2 T-handle so no tools are required to fasten to the pipe. Comes with 1 x 1/2 -13 TPI Grade 5 fastener and 1 diameter Belleville Spring washer. 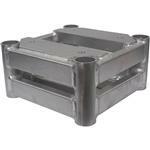 The Swivel Coupler will fasten from 1-1/4" pipe (1.660" OD) to 2.050" OD truss tube. The Swivel-Coupler has wide wing nuts for fastening the clamp to the pipe or tube. The Swivel Coupler can be locked into a 90 degree fixed coupler by adding an optional 7/32" × 2" spiral pin (not included). 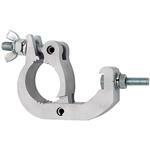 If you're ever working with truss or pipe, this clamp can be your best friend. Show Solutions' SP Pro Series is an industry standard used by concert tours, production houses and large scale stage set-up companies. 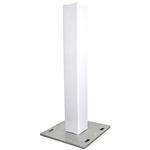 The Mega Airwall Hanger 4" is 500 pound load rated. The Mega-Airwall Hanger will fit a wide variety of air wall tracks. The Mega Airwall Hanger engages the airwall track the full length of the hanger giving a total of 8 inches of metal to metal connection. The Mega-Airwall Hanger panels move outward and apart at the top to engage the airwall track. The tops of the hanger panels have a continuous lip that rests on the load bearing portion of the airwall track. 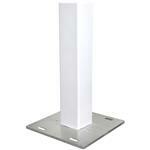 The Mega Airwall Hanger 7" is 750 pound load rated. 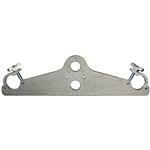 The Mega-Airwall Hanger will fit a wide variety of air wall tracks. The Mega Airwall Hanger engages the airwall track the full length of the hanger giving a total of 14 inches of metal to metal connection. The Mega-Airwall Hanger panels move outward and apart at the top to engage the airwall track. The tops of the hanger panels have a continuous lip that rests on the load bearing portion of the airwall track. The Mega Tie-Off is used backstage for securing boom base pipes to the grid for safety. 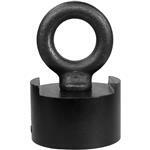 The 1/2" eye bolt swivels 360*. Has 1.5 MPT pipe threads and a 1/2" two-way lock nut secured with permanent Loctite.